The Marzano High Reliability Schools™ framework does not add a new initiative to school efforts. Many schools are already implementing a wide range of effective initiatives, and many educators are already practicing research-based strategies. 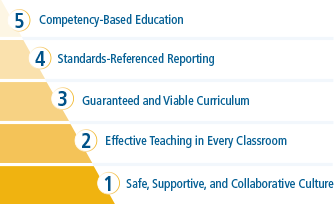 The HRS framework does not replace professional learning communities, the Art and Science of Teaching framework, teacher evaluation and development, sound curriculum (including those aligned with the Common Core State Standards), vocabulary instruction, instruction in critical thinking and reasoning skills, formative assessment, standards-based grading and reporting systems, or student mastery systems. Using the framework and indicators, districts and schools can drive permanent, positive, and significant impacts on student achievement by synthesizing multiple complex initiatives into one harmonious system.